Public Safety News: Distracted driving is a major safety concern, yet state law does not make texting while driving a primary offense. Boca Raton was the first city to pass a resolution in support of state legislation to change that, and this legislative session may see it pass. 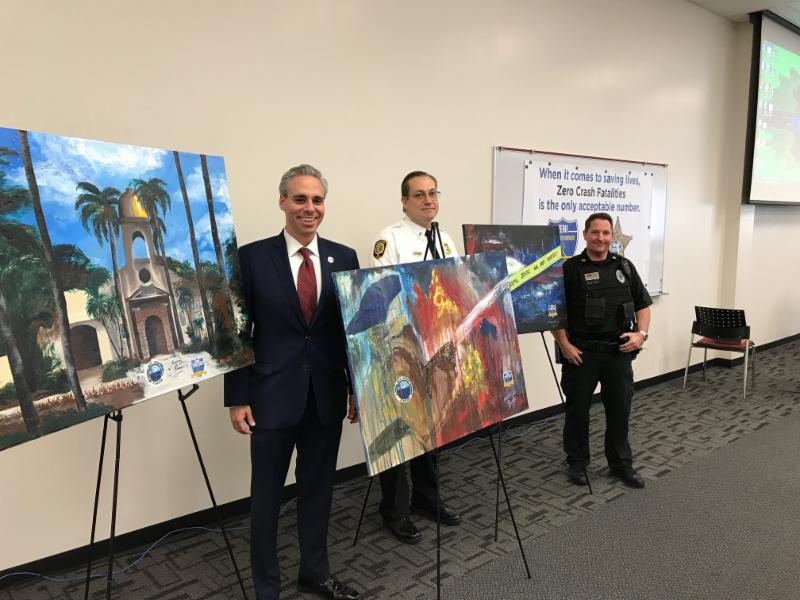 Groups like the Dori Saves Lives non-profit organization are helping to lead the way in advocacy for this important effort, and it recently presented these paintings in recognition of our outstanding Police Services and Fire Rescue Departments. Dori Saves Lives also chose Boca Raton as the site for its annual driver safety conference with more than 100 safety experts, drivers' education teachers, and law enforcement officers. Please remember to keep your hands on the wheel, not your phone. Please contact me with any concerns or ideas on how I can better serve you. Please also visit myboca.us for more info about upcoming events and city business. City Council and CRA meetings are typically on Mondays at 1:30pm and Tuesdays at 6pm on the second and fourth weeks of each month at City Hall, 201 W. Palmetto Park Road. Your opinion matters to me! Many thanks!